Silver banner casing provides a crisp clear look. Ingenious bar snaps closed after graphic insertion with incredible strength, torque, and care. 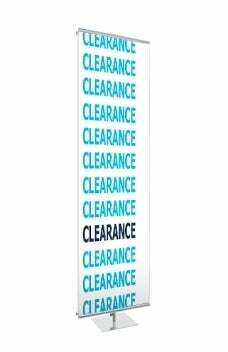 4 bars included with every order for banner mounting. Display either 1 graphic, or 2 back to back. Telescopic uprights with knurled locks. Features a 16" square base. Does not work with grommeted banners.